This being the fourth printing of this report, we have modified the content by the addition of much more information that we have been able to uncover through the past few years. You will now discover the first phenomena that “led” us to our mathematical Bible discovery. We have also uncovered a phenomena that shows God selected which books of the Bible would be included – not man as claimed by many. The original report was written solely as a “FACT SHEET” to be given to agnostic or atheist “intellectuals” by believers in the Lord Jesus Christ to literally show in the “scientific” methods of proof that the arguments they wish to make with believers are not with the believers, but are, IN FACT, with the AUTHOR of the BIBLE – GOD. It was designed to stop “attacks” on believers who believe on faith and do not have the “intellectual” ability to discuss matters with intellectuals who have presuppositions that there is not (or there may not be) a living God. Although we have a great deal of phenomena discovered, we will concentrate on the Number SEVEN, as this is the number attributed to God. (Created the earth in SEVEN days, etc.) In this document, you will read of FACTS and PROOFS of God being the AUTHOR of the BIBLE. By using the same basic phenomena, based on the FACT that GOD IS THE SAME YESTERDAY, TODAY AND TOMORROW, (Hebrews 13:8) you may make comparisons of other writings alleged to be God’s Scripture. In this age, there seem to be many “intellectuals” both in the Christian community and outside it that disclaim the inspiration of the Bible by God. Denominations, sects and cults are coming into being on a daily basis that attempt to dehumanize Jesus or to humanize God, and in most cases, attempt to make the Bible into GOD. No errors have been found by this organization, and all alleged errors have been shown, in context, to be non-existent upon careful investigation. Inmost cases, the believer has been confronted with the claim that”there is no scientific proof” of the Bible. The definition of”Scientific” means that the evidence can be reproduced under laboratory conditions. You will find that all evidence presented will qualify as “Scientific” in the sense that it can be repeated under such conditions, and we invite such scrutiny. In addition, the sciences of archaeology, astronomy, physics, Astro-physics or mathematics all have produced evidence of the correctness of the Bible- even when the Bible was contradictory to the “known” science of a particular period of time. We have discovered additional collaboration of our findings in the work of one Dr. Ivan Panin, who spent his life in bible research. We deeply admire the effort and results of Dr. Panin, and dedicate this writing to his memory and to the Glory of our mutual Savior, Jesus Christ. If GOD inspired the scriptures, then they cannot be anything other than TRUTH. That ANY teachings that ADD or SUBTRACT from the 66 books of the Bible are NOT OF GOD, THE AUTHOR of these 66 books. Jesus Christ commanded that “Not one jot or tittle be added or removed” from the Scriptures until His coming, again. Jesus and the angels at Pentecost clearly made it known that Jesus would return EXACTLY as He left – BODILY and FROM THE HEAVENS! In discussing the matter of the evidence being presented in this report, it is imperative that we provide an explanation of the inherent factors of the HEBREW, ARAMAIC and GREEK languages. These languages were unique in that they did not have a set of characters to represent numbers such as our present 1,2,3, etc. Instead, the Hebrew language made use of the letters of the alphabet; so that the first letter of the alphabet stood for 1, the second for 2, the third for 3,etc., until the 11th letter represented 20, the twelfth letter 30,etc. through 800. (The Greek language also had this particular feature). Thus each letter had a numeric value. In this manner, each word can be given a value by adding the cumulative total value of each of its letters. Now that we have explained the “difficulties” of these languages, we will now proceed with the “narration” of the first lead we received in our investigation to ascertain if there was any basis for “scientifically” proving the Bible. The Bible begins with “IN THE BEGINNING GOD CREATED THE HEAVENS AND THE EARTH”. The number of words in the original Hebrew (which was the language of the Old Testament) is SEVEN words. These SEVEN words have 28 letters (4×7). These 28 letters are divided like this: The first three words (containing the subject and predicate of the sentence – “In the beginning God created” -) have 14 letters (2×7); the last four words (containing the object of the sentence – “the heavens and the earth” -) also have 14 letters (2×7). The last four words are thus subdivided: The fourth and fifth words(Containing one object – “the heavens” -) have SEVEN letters (7); the sixth and SEVENth words (containing the second object – “and the earth” -) also have SEVEN letters (7). In relation to the importance of the words themselves, the 28 letters are thus divided: The three leading words GOD the subject, heaven and earth the two objects, have 14 letters (2×7). The numeric value of the first, middle, and last letters of this sentence is 133 (19×7), while the numeric value of the first and last letters of all seven words in this verse is 1393 (199×7). The first and last letters of the first and last words have 497 (71×7); the remaining words (between the first and last) have 896(2x2x2x2x2x2x2x7). We break this amount down due to the factors being SEVEN and TWO taken as a factor SEVEN times. The three important nouns, God, heaven, and earth, have 14 letters (2×7). The numeric value is 777 (111×7). The one verb, created, has 203 (29×7). In this verse of only SEVEN words there are some repetitions. The untranslatable particle ETH occurs twice and the article THE also occurs twice. The numeric value of these repetitions is 406 (58×7). (2) It would also hold true for the New Testament (even though the New Testament was written in Greek) in IDENTICAL patterns. (3) Finally, we can also use the progressions of numerics as a test of other texts that have been claimed to be revelations from God. If the language of the ORIGINAL text is not Greek, Hebrew, or Aramaic /Chaldean, then sufficient kinds of numeric structures will be evident in as much as the language will permit. We ask that you take any of these texts and test them against these structures. If they contain any multiples of the numerics shown here, we would like to have you communicate with us by directing a copy of the text, source of the text, and your name, address, and phone number. Now, with this “key” provided us in Genesis 1:1, we will proceeded to analyze the whole Bible. Keep in mind that there are in excess of three million words, or twenty million characters, in the 66 books of the Bible. Also keep in mind that the “evidence” we are about to present would be null and void, in most cases, if EVEN ONE CHARACTER WERE DELETED, CHANGED OR ADDED! 1. The NUMBER of WORDS in the VOCABULARY will divide evenly by SEVEN. The NUMBER of WORDS that begin with a vowel will divide evenly by SEVEN. The NUMBER of WORDS that begin with a consonant will divide evenly by SEVEN. The NUMBER of WORDS that begin with each letter of the language’s alphabet will divide evenly by SEVEN. The NUMBER of WORDS that occur more than once will divide evenly by SEVEN. The NUMBER of WORDS that occur only once will divide evenly by SEVEN. The NUMBER of WORDS that occur in only one form will divide evenly by SEVEN. The NUMBER of WORDS that occur in more than one form will divide evenly by SEVEN. The NUMBER of WORDS that are not nouns will divide evenly by SEVEN. The NUMBER of LETTERS in the vocabulary will divide evenly by SEVEN. The NUMBER of LETTERS that are vowels will divide evenly by SEVEN. The NUMBER of LETTERS that are consonants will divide evenly by SEVEN. The NUMBER of PROPER NAMES will divide evenly by SEVEN. The NUMBER of MALE PROPER NAMES will divide evenly by SEVEN. The NUMBER of FEMALE PROPER NAMES will divide evenly by SEVEN. The TOTAL NUMERIC VALUE OF ALL THE WORDS will divide evenly by SEVEN. The NUMERIC VALUE OF THE VARIOUS FORMS in which the words occur will divide evenly by SEVEN. The NUMBER OF WORDS THAT ARE FOUND IN ONLY ONE BOOK OF THE BIBLE will divide evenly by SEVEN. The NUMBER OF PROMISES FOUND in the BIBLE will divide evenly by SEVEN. The NUMBER OF DISPENSATION PERIODS is SEVEN. The NUMBER OF GENERATIONS FROM ABRAHAM TO JESUS CHRIST will divide evenly by SEVEN. 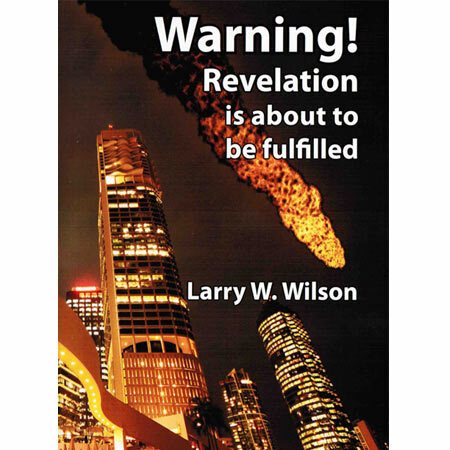 The BOOK OF REVELATION outlines SEVEN JUDGMENTS that will be made on the Earth and its Peoples. The BOOK OF REVELATION outlines SEVEN PLAGUES that will be made on the Earth and its Peoples. One of the above phenomena is followed by several asterisks (*). The notation is made because we became unable to compute themathematical probabilities AT THAT PHENOMENA. (Note how many came after that!!!). We had to suspend our investigation until we could provide some basis of relating the probabilities, with some term that could convey the extent of the matter. Upon conferring with the math department of Stanford University, we were advised that there is a term called a Google (some spellings show Gugle) which is ONE BILLION TO THE BILLIONTH POWER! The term GOOGLEPLEX, then, is a GOOGLE to the power of GOOGLE, and this is what is reached at the occurrence we have noted with the asterisk! A GOOGLE amount of years can be referenced by stating that if we had a mountain the size of Mount Everest that was solid DIAMOND, and we allowed a bird to come ONCE A YEAR and MAKE ONE PECK against this mountain, IT WOULD TAKE A GOOGLE OF YEARS TO ERODE THAT MOUNTAIN TO SEA LEVEL! We wish to re-stress the fact that if EVEN ONE CHARACTER was changed, ADDED, or SUBTRACTED to the 66 books, then most of the above results would not have been produced! To state that God is far above man in intelligence is so much an understatement that we even hesitate to make such a mention; However, there always seems to be someone that does not realize the extent of these proofs as shown. Some of the proofs are truly unique; such as, the NUMBER OF MALE PROPER NAMES could not hold true UNLESS Moses is mentioned ONLY ONETIME in the Book of Revelation! The issue of BIBLE ERRANCY is put to rest by these proofs. God is shown to have dictated EACH AND EVERY CHARACTER of the Bible, and it is inconceivable that God can make an error. The issue of CONSPIRACY is put to rest by showing that ONLY GOD could have put the characters together over fifteen hundred years,through three different languages, and through use of several men from widely differing backgrounds. Some Epistles were written at a single sitting, and within a matter of minutes. The number of hours it would have taken for even the writers that lived in the same time frame to get together and CONSPIRE to produce these harmonic features is beyond any belief. It is to be noted that THE ONLY POSSIBLE WAY FOR THE WRITERS TO WRITE THEIR BOOKS, AND HAVE THE PHENOMENA OF HAVING WORDS THAT ONLY THEY USED, would have required that each and every one of them write their book LAST! Although the phenomena we discovered only occur in the original (Please refer to this subject in the book EVIDENCE THAT DEMANDS A VERDICT by Josh McDowell, who explains the ability to have “original”Scriptures far better than we could), we feel it necessary to state that Translations DO NOT CONTAIN many of the phenomena. The doctrines of the Bible, however, do hold consistent, and should be the most important feature of any translation. The phenomena must occur in a natural feature of the language in which it was written, and translations are unable to maintain such phenomena. An impressive feature, and one that caused us great difficulty, is that by the addition of the Apocryphal books, the phenomena that occur in the Bible as a WHOLE is thwarted. Not one of the phenomena, (number of Proper Names, Number of Words in Alphabet, etc.) remains when these books are considered, AND not one of these books contains ANY phenomena of any ascertainable sort! It is our opinion that this clearly refutes any claim by any religion, that these books are from God. It is our contention that the fact that these books do not contain even ONE of the phenomena, is sufficient evidence that they should not be considered Scripture. As for the “revisions” made by the Mormon church or by Jehovah’s Witnesses, we can only state that these changes eliminate the phenomena, again a basis for rejection of their claims on a “correct”version. As we completed these investigations, we then focused our attention on the writings alleged to be “additional” Scriptures, such as the Book of Mormon, Pearl of Great Price, Koran, Doctrine and Covenants of the Mormon Church, and Commandments of the Mormon church, as well as writings from Moses David of the Children of God, Mary Baker Eddy of Christian Science, and many, many others. IN EACH AND EVERY CASE, THE ALLEGED “SCRIPTURES” FAILED ON EVERY POSSIBLE PHENOMENA. We used the language that the claimed writings were in and looked for phenomena that could be utilized by God within those languages. For English, we felt that phenomena of Number of letters or words in the alphabet, consonants and vowels, number of proper names, etc. could be found if from God. Any phenomena found was sporadic, not consistent, and therefore not of God. For us, and those who wish to accept such, we felt that this was sufficient proof that these religions claiming guidance from God,were, at best, being deceived by as good a counterfeit as man or Satan could devise. Some of the books assign themselves, either totally or in part toa particular scribe’s name, while others are anonymous. The books which reveal (in part or totally) the scribe’s identity are: Exodus, Leviticus, Numbers, and Deuteronomy ascribe themselves to Moses, and are ascribed to Moses in other books of the Bible. Isaiah, Jeremiah, Ezekiel and the 12 minor Prophets ascribe themselves to the scribes whose name the book bears. Psalms is ascribed to David. Proverbs and Song of Solomon ascribe themselves to Solomon, and Ecclesiastes ascribes itself only to the “son of David” which most believe to be Solomon. Daniel, Ezra and Nehemiah ascribe themselves to these respective scribes. James, 1 and 2 Peter, and Jude bear the names of their respective scribe. The Epistles of Paul ascribe themselves, with the exception of Hebrews, to Paul. Revelation ascribes itself to John. Moses has 4, Solomon 3, Peter 2, Paul 13, and the other identified scribes have one book each. The anonymous books, therefore, are: Genesis, Joshua, Judges, 1 and 2 Samuel, 1 and 2 Kings, Job, Ruth, Lamentations, Esther, 1 and 2 Chronicles, Matthew, Mark, Luke, John, Acts, 2 and 3 John, and Hebrews. The number 66 is 6 -11’s (Feature 1). The anonymous books are 22 or 2-11’s. The non-anonymous books are 44 or 4-11’s (Feature 2). Of these 44, 22 (or 2-11’s) belong to writers of more than one book, and 22 (again 2-11’s) belong to writers of only one book (Feature 3). The sum of the 66 numbers totals 2,211 or 201-11’s. We can divide this number in this manner: The 22 books of the writers of more than one book have 946 (or 86-11’s), while the other 44 have 1,265 (or 115-11’s) (Feature 4). Of the 66 books, 21 are Epistles. Their numbers are (James to Philemon or 45 to 65). The sum 2,211 for the 66 books can be divided between Epistles and Non-Epistles. The Epistles have 1,155 (or 105-11’s) and the non-epistles have 1,056 (or 96-11’s) (Feature 5). Moses, David, Isaiah, Jeremiah, Hosea, Joel and Daniel are expressly quoted in the New Testament. The number of their respective books are 2,3,4,5,12,13,15,16,27,35. The total sum of these books is (Feature 6) 132 (or 12-11’s). The total sum of these is 7,931 – which is 11 X 7 X 103. This can also be expressed as 721-11’s, while the sum of the factors 7, 11, and 103 is 121 or 11-11’s (Features 7 and 8). There may be some that may claim that this could be accidental or by design. That the number of books in the Bible should be a multiple of 11 could possibly be accidental. However, since only every 11th number is a multiple of 11, then THE CHANCE OF ACCIDENT IS 1 IN 11! That this number can be divided between anonymous and non-anonymous books in such a manner as to be multiples of 11 could also be an accident. However, THE CHANCE IS 1 IN 11 TIMES 11 or ONE CHANCE IN 121! That this number can be divided between the non- anonymous by 11’samong the authors of only one book and those of more than one book could also be accidental. However, the chance for it being accident is ONE IN 11 TIMES 11 TIMES 11 or ONE CHANCE IN 1,331. If we carry out the progressions through the eight occurrences proven above, we concede that each one could be accidental. However, the chance for them ALL being so becomes ONE CHANCE IN 11 TO THE EIGHTH POWER or ONE IN 214,358,881! The sum of the numeric values of the 26 authors named as Biblical writers which was shown above as 7931 is a multiple of seven (Feature9) as well as eleven. The sums of the numeric values of the 26writers (7,931) is a multiple of 11. Of this number, the 21 writers of the Old testament (3-7’s) have 3,808 or 544-7’s and the New Testament writers have (Feature 10) 4,123 or 589-7’s. Of the 3,808 belonging to the Old Testament, 2,933 or 419-7’s belong to the writers of the Law and the Prophets, from Moses to Malachi, and 1,190 or 170-7’s belong to the writers of the hagiographa, from David to Nehemiah (Feature 11). Seven of the 21 Old Testament writers (3-7’s) are expressly named in the New Testament; These are Moses, David, Isaiah,Jeremiah, Daniel, Hosea and Joel. Their numeric value is 1,554 or222-7’s (Features 12 & 13). The Bible begins with the Hebrew word “beginning” and ends with the Greek word “saint”. The Hebrew word occurs in the following books: Genesis, Exodus, Leviticus, Numbers, Deuteronomy, 1 Samuel, Isaiah, Jeremiah, Ezekiel, Hosea, Amos, Micah, Psalms, Proverbs, Job, Ecclesiastes, Daniel, Nehemiah and 2 Chronicles. The Greek word occurs in Matthew, Mark, Luke, John, Acts, 1 Peter, 2 Peter, 1 John, Jude, Romans, 1 Corinthians, 2 Corinthians, Ephesians, Philemon and Revelation. These books total 42 or 6-7’s. Take the number of these books in the order of their respective place and the sum is 1575 or225-7’s. The possibility of these eight features of SEVEN, and the eight features of ELEVEN occurring together, is ONE IN 5,764,801 TIMES 214,358,881 or ONE IN ONE THOUSAND MILLION MILLIONS ! The Bible was written by some thirty different writers from many different walks of life over a period of sixteen hundred years between its first and last writers. If we assume that it was exclusively written by HUMAN hands, we cannot account for the mathematic phenomena demonstrated. If we assume that a SUPERIOR MATHEMATICAL MIND (The Mathematical Author of Nature) has planned these phenomena, then we are provided with an immediate and rational explanation of these phenomena and others found in the Bible. The genealogy of Christ as found in Matthew 1:1-17 consists of two main divisions: Verses 1-11 cover the period from Abraham, the father of the chosen people, to the Captivity, when the Jews ceased being an independent people. Verses 12-17 cover the period from the Captivity to the promised Messiah, The Christ. The Vocabulary has 49 words (7 x 7). Of these 49 words, 28 (4×7)begin with a vowel; and 21 (3×7) begin with a consonant. Seven words end with a vowel (1×7) and 42 (6×7) end with a consonant. These 49words consist of 266 letters (7x2x19 OR 38×7). Of these 266 letters, 140 (20×7) are vowels and 126 (18×7) are consonants. Of these 49 words, 35 (5×7) occur more than once in this passage, while 14 (2×7)occur only once. Seven (1×7) occur in more than one form, while 42(6×7) occur in only one form. 42 words (6×7) are nouns while 7 (1×7)words are not nouns. Of these nouns, 35 (5×7) are proper names, and 7(1×7) are common nouns. Of the proper names, 28 (4×7) are male ancestors, while 7 (1×7) are not. 1 in 10 to the power of 169 or 1 followed by 169 zeros! It is not the desire of this report to provide anything other than an insight into the immeasurable intelligence that produced the Bible. The same intelligence that produced the limitless stretches of space, that produced the smallest one cell creature, the same one that created it ALL, is the only source that could have produced the Bible as it presently stands. We actively solicit any and all comments that may be made concerning this document and its results. Friends, there's a nationwide Heroin epidemic. If this is happening to someone you love, get them help. They won't likely seek it on their own. The phone number is on the heroin addiction help centers and hospitals site.